It’s a Friday afternoon in late Summer and I’ve just received a text message from CB. Jambalaya and Coronas. That’s all it says. Not Do you want jambalaya for dinner? Not Can you pick up some Coronas on your way back from work? Not even What do you want for dinner? However, I think we both understand that our relationship with food is beyond this. It’s simultaneously a request and a call to arms. I text back: Yes. 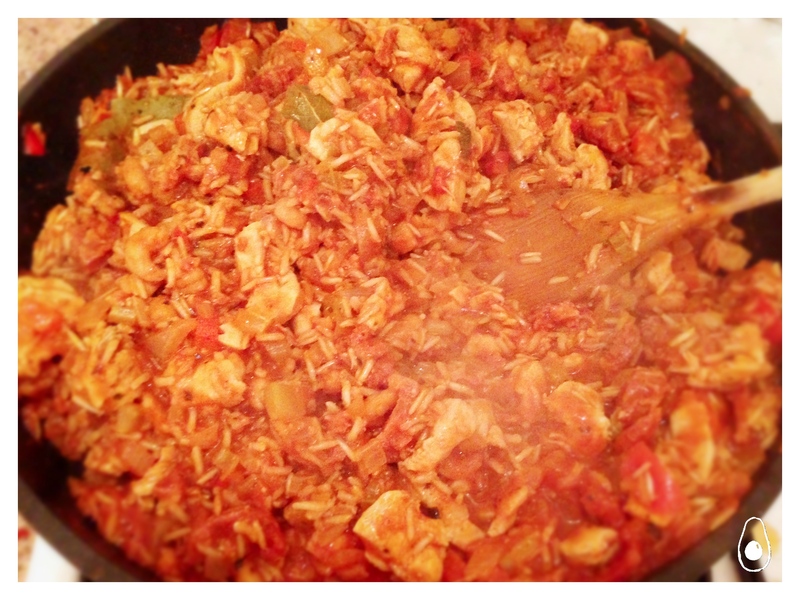 There’s something inherently delicious about jambalaya. It’s component parts are as tasty as the sum of all its parts. Meat (on meat, on meat), flavoursome tomato sauce, herbs, rice – what’s not to like? It’s incredibly comforting but has lots of bright flavours which remind me of warmer months. This dish suits well for entertaining large crowds. We used 200g of rice which we first thought would be enough for 4 portions but we ended up enjoying this over six servings. As with all of our recipes, we use brown rice which increases cooking time by about 20 minutes. For this dish we’ve used fairly cheap frozen prawns – it seemed a little decadent to go for the king prawns on top of two other meats. I should also just state for the record that I continue to find celery to be the most toxic and foul-tasting food in this world and the next. It’s made it into this recipe thanks to my better judgement and the concession that it would be diced so finely it would be invisible to the naked eye. This is potentially one of the most grown up decisions I’ve ever made. Enjoy with the biggest glass of wine you can get your hands on. A wide, shallow, heavy-set pan. Warm the olive oil in a wide and shallow pan on the hob and add the diced onion, pepper and celery. Lightly fry on a medium-low heat for a few minutes while you dice the chicken breast. 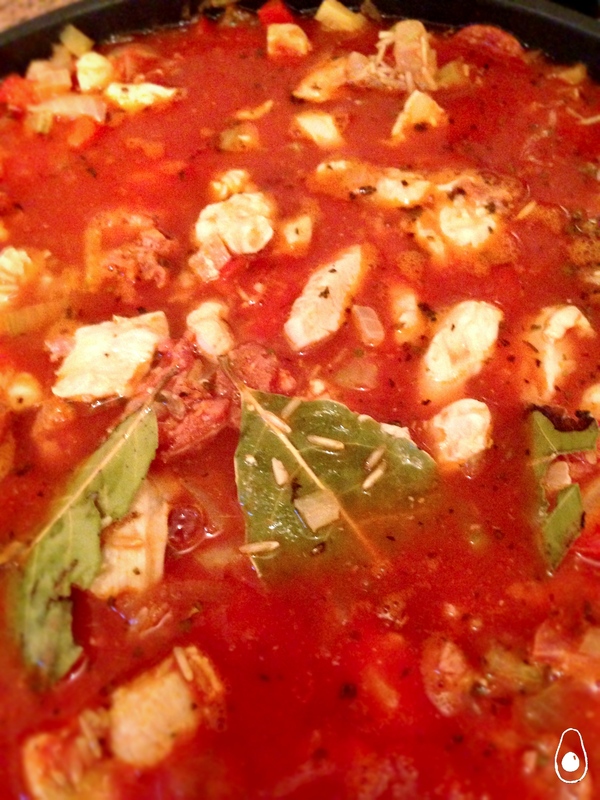 Add the chicken, chorizo, garlic, and bay leaves. Fry on a medium heat until the chicken is no longer pink (around 5-7 minutes). Stir in the passata, stock, and rice. Bring to the boil and then allow to simmer until the rice is cooked, periodically stirring the mix and adding more water to keep a fairly moist consistency. This will take around 45-50 minutes for brown rice, but will be quicker for white grains so be sure to keep testing. While the rice mix is cooking, heat a little oil in a separate pan and gently fry the prawns with the cajun spice for 2 minutes. Add the prawns and their liquid into the rice mix. Once the rice is cooked, add hot sauce, freshly ground black pepper and lemon juice to taste. Garnish with chopped spring onions. I love this stuff but have never made it. I’m going to change that now! Pinning. Love Jambalaya, and yours sure looks a treat! Yum! This sounds so flavourful! What a lovely recipe! i’ve never heard about this recipe, but it looks very very good! Thanks a lot for being at FF, new recipes are very welcome! Mandy, I used to feel the same way about celery, mainly due to a really horrible childhood experience (celery and carrot juice as part of a detox to rid me of asthma, apparently). Then a really good friend of mine made something with it chopped finely and I couldn’t taste it at all and I realised that I could use it in sauces like you have done with this gorgeous sounding jambayla. I love your relationship with CB – how wonderful that so few words are needed!!! Love Jambalaya! What is passata? Thanks Suchitra! Passata is tomato that has been sieved of all skin and seeds. I believe it’s sometimes cooked (to develop the flavour) but is also ocassionally uncooked. I use it because it adds a great tomato base without having to wait for the flavour to develop/mature through cooking. Give it a try! !